Recognition of size, weight, shapes and form of objects (stereognosis). Before starting the examination, explain the nature of the test to be performed to the patient to get his full cooperation. The eyes should then be closed and test different forms of sensations. Always compare corresponding points on both sides of the body. In routinely involves assessing the sensation of the hands, lower arms, abdomen, feet and lower legs. 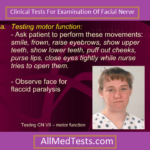 Facial sensation is tested during the evaluation of cranial nerves. 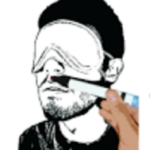 The sensations are evaluated with the patient’s eyes closed. The simulation is presented minimally at first and then its intensity is increased until the patient becomes aware of the stimulation. The sensations should be compared on both sides of the body and they should be of equal intensity. The stimuli should have correct location and correct identification. Sensory impairments should be mapped on a body figure which represents the dermatomes. Use a wisp of cotton wool or hair aesthesiometer. Tell the patient to say yes every time the feels a touch comparing corresponding points on both side of the body. Repeat the test like light touch with the tip of a finger or any blunt object the temperature of which does not differ much from that of the skin. Loss of tactile sensation is called anaesthesia, if it is partial loss it is called hypoaesthesia. Use the point of a sterile steel pin or a needle to test superficial pain sensation. Allow several seconds between stimuli. Ask the patient to identify where the sensation is felt and ask the patient whether pain is sharp or dull. The technique is almost same as that used for touch. It is tested by squeezing the muscle like biceps, triceps and calf muscles. It can also be done with the help of algometer. With help of this instrument, we can measure the threshold pressure, which causes the pressure pain. Absence of sensibility of pain is termed analgesia, partial loss of pain sensation is called hypoalgesia, and exaggerated pain sensibility is known as hyperalgesia. It is tested using test tubes containing hot and cold water. The part to be tested is touched with each in turn, and the patient says whether each tube feels hot or cold. First of all ask the position to close his eyes, and take hold of one of his limbs and move it about in various direction through the air. Finally leaving it in some definite position say semi flexed and slightly elevated, ask him to put his corresponding limb in a similar position. If the subject is able to place the other limb in same position his sense of position is intact. In case of foot he may be told that the great toe will be placed pointing upwards or downwards and he is asked to tell where it is. A tuning fork is made to vibrate by striking the prongs gently on a firm object like rubber pad. Its foot is then placed on the bony prominence of toes, ankle, shins, finger joints, wrist, elbows, shoulders and sternum. Ask the patient to say yes and where the vibration is felt. The ankle is a commonly tested site. Ascertain it the patient receive the vibration, and if so, ask him to say once again when he ceases to feel them. The fork is transferred to the same region of the observer for comparison. If the examiner still perceive the vibrations, the patient’s perception of vibration is impaired. There is often loss of vibration sense in the feet and legs in old age. Vibration sensibility may be lost in tables dorsalis, peripheral neuritis and posterior column disorders. The is termed as paraesthesia and consists of various sensations experienced by the patient in the absence of outside stimulus. The commonest of these are feeling of pins and needles, of numbness, as heats or chills, of pressure or tightness, of itching sometimes termed pruritis or a feeling if insects were crawling over the body which is called formication. The skin of the patient is touched and stimulus is withdrawn. The patient is asked to tell the area of the skin touched after you have removed stimulus. Normal subjects feel no difficulty in identifying the site touched. It is not enough to find out that the patient can feel the touch. One should find out whether he can localize it and whether he can discriminate between two points which is called two point localization. It is done with the help of compass aesthesiometer. Normally two mm of separation of points can be appreciated on the palmer surface of the thumb and fingers. This distance depends upon the number of tactile receptors in the area. Recognition of size, shape, weight and form is called stereognosis. 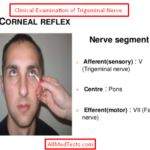 These faculties can be tested most accurately in both hands one by one with the eyes closed. To test sizes, place in the patient’s palm objects of same shape, but of different sizes, for example small rods of different lengths. Ask him to say which is the larger. To test recognition of shape familiar objects such as coins, a pencil, scissors, key etc are placed in the hand and the patient is asked to identify them by manipulation. Loss of this faculty is known as astereognosis. It may occur, with patient lesions, when position sense and light touch are normal, although there is usually some defect in these modalities. When astereognosis occur with posterior column lesions, position sense, vibration sense and light touch are invariably profoundly disturbed. In this test stick of a cotton applicator is used to draw or write a number or letter on the palm of the patient’s hand. The patient is asked to identify the number or letter. Repeat this procedure with different number or letters on the other hand. The patient should be able to recognize the number or letter. The patient is touched on the same body parts bilaterally with a sterile needle point. The patient should be able to detect both stimuli and identify their location.